zarinahtakesapaycut: Part 3: MD of PwC Malaysia knowingly signed a false declaration: Here's the proof! Part 3: MD of PwC Malaysia knowingly signed a false declaration: Here's the proof! 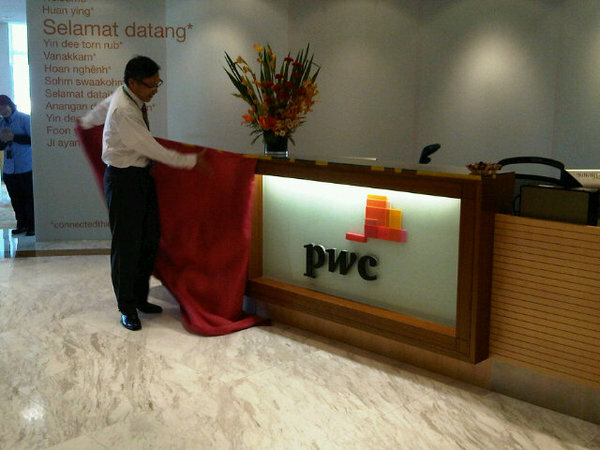 The MD of PwC Malaysia, Chin Kwai Fatt, launching the new PwC logo, which is not an illegal or fraudulent act. In Part 1 and Part 2 of this series we showed how the MD of PwC in Malaysia, Mr Chin Kwai Fatt knowingly signed a false declaration with regards to the ability of PricewaterhouseCoopers Consulting Sdn Bhd (464379-U) to meet its liabilities as and when the liabilities fall due, when the contingent liabilities arising from several lawsuits the company is facing were not disclosed, as well as the failure of the company to meet the cash flow solvency and balance sheet solvency tests, so that it may meet the contingent liabilities as and when they may fall due. PricewaterhouseCoopers Consulting Sdn Bhd (464379-U), in its 2009 returns also did not comply with the SSM practice note 1/2008, which would have made it more difficult for Chin Kwai Fatt to continue hiding the contingent liabilities, as well as hide the fact that the company does not have the means to meet them, which is a clear act to defraud the company's creditors, perpetrated by the MD of the country's largest audit firm. The mainstream media has written about this blog, and we have also seen many of the posts here published in top blogs like RPK's Malaysia-Today. But yet the management of PwC remains silent about the many allegations of fraudulent acts, as well as corrupt practices we have tried to bring to the light here. This does not bode well for the state of corporate governance in Malaysia, as the lethargy seen in taking to task the very people who should be ensuring the sanctity of the CG framework in this country is very worrying. We have to understand that most countries will not take things easy, when the senior partners of the audit firm that handles the audits for many of the largest Government Linked Companies as well as more than a hundred public listed companies are implicated in fraudulent and corrupt acts. The people would expect questions to be answered, and if the answers are not satisfactory, investigations to be launched, because to not do so will put billions of dollars of the public's money at risk. Foreign investors will also find it worrying that a country that is throwing slogans like Economic Transformation and what not, does not walk the talk when questions are asked on the real independence and ability of the country's regulatory watchdogs. If Chin Kwai Fatt is also allowed to get away with signing a false declaration, on top of the many other acts alleged here and elsewhere, then the people will really have to ask themselves why it is so easy for some people to be above the law, regardless of what they do.